Ask most people about Philadelphia cuisine, and the first thing they mention is the Philly cheesesteak. Tourists flock to Pat’s and Geno’s for them. Restaurants around the country unsuccessfully imitate the concept with Frankenstein-like concoctions including lettuce, tomato and mayonnaise. Suffice to say, the cheesesteak is famous. But it’s not even the best sandwich in Philadelphia. The Italian roast pork sandwich is Philly’s best sandwich, without question. But so few places can pull off this sandwich that it isn’t as famous. I discovered the sandwich at, of all places, a Cherry Hill deli near my old office at the Courier-Post newspaper. Then I found Tommy DiNic’s at Reading Terminal Market, where they set the standard for the perfect roast pork sandwich. Tony Luke’s does it fairly well too, and while John’s Roast Pork is supposedly terrific, they were always closed by the time I got there. If there’s another shop that can nail this sandwich, I don’t know it. Its superiority to the cheesesteak illustrates that sometimes the commonly accepted wisdom doesn’t capture the underlying truth. A few recent situations with Philadelphia Union struck me as fitting that category, so I used them as an excuse to write about sandwiches on a site that you read for soccer. But now that I’ve stretched this metaphor and your patience as far as both will go, here are those local soccer situations in which the roast pork–cheesesteak dichotomy explains Philadelphia Union. Why did Amobi get snubbed? No Philadelphia Union player will attend the U.S. National Team camp in January. For Jack McInerney, Sheanon Williams and Jeff Parke, their exclusions probably sting, but they were not surprising. Parke is a bubble player at a deep center back position and on the wrong side of 30. McInerney’s ice cold summer doomed his chances. Williams has a “no respect” thing going on, and while Chance Myers deserved the trip, DeAndre Yedlin is criminally overrated despite his promise. Amobi Okugo’s exclusion was a stunner, however. People have extrapolated all sorts of meaning from it. Maybe Klinsmann views Okugo more as a midfielder. Maybe Klinsmann doesn’t think much of the Union. And so on. Those ideas are so cheesesteak. Here’s the roast pork. Four center backs were called in for a camp comprised almost entirely of MLS players. Three — Matt Besler, Omar Gonzalez, and Clarence Goodson — are near locks for the World Cup, which makes center back the national team position most dominated by MLS players. The fourth player, Shane O’Neill, was Okugo’s competition. He is in a similar situation. Both are young: O’Neill is 20, Okugo 22. Neither is cap-tied to the U.S., and each could play for another country. (Okugo for Nigeria, O’Neill for Ireland.) Both are rising talents. Neither is making the World Cup squad ahead of Geoff Cameron, who plays professionally in England and won’t be in camp. In all likelihood, O’Neill’s stronger ties to Ireland were a deciding factor. Okugo has been part of U.S. youth national teams since he was a teenager. He was born in the United States. He was even at Bradenton. While it would be good to cap-tie him sooner than later, he looks like less of a risk to bolt for the Nigerian team. Barring an unexpected stall in his development, he will play for the senior U.S. national team at some point. O’Neill is a different story. He could genuinely bolt for the Ireland national team. His family is basically Irish sports royalty. Both his father and uncle were top Gaelic footballers. Much of his family still lives in Ireland. He was born in Ireland. He has spoken openly about possibly playing for Ireland, and the Irish national team has shown more willingness to reach out to its American diaspora (Ryan Meara, for example) than Nigeria. Finally, O’Neill has much less history with U.S. youth national teams, earning his first youth cap in October 2012. By bringing O’Neill into camp, Klinsmann is sending him a message that the national team is taking him seriously, and he has to, because Irish competition is likely. Did Okugo deserve the same statement and opportunity? Yes. But the fact that Okugo didn’t make the camp may have more to do with the strong crop of American center backs in MLS and Ireland poaching O’Neill than it does with Philadelphia Union’s choice of Okugo’s position. Is Marco Pappa a perfect fit for the Union? You may remember Pappa as a top left-footed wide midfielder for the Chicago Fire. He left for the Dutch league last year and got stapled to the bench there. Now he supposedly wants to come back to MLS. The Union currently have the sixth spot in the allocation order, which is how an MLS club must acquire Pappa’s rights, because he left the league for a transfer fee. They could move up via trade, as Montreal might, or grab Pappa if other teams pass. But Pappa is cheesesteak. The roast pork is his former agent and Chicago teammate, Diego Gutierrez. Yes, that’s the same Gutierrez who became the Union’s top scout, was fired by Hackworth in one of his first personnel actions as manager, and whose scouting finds have been completely purged from the roster. Don’t bet on Hackworth acquiring any player whose contract might even get sniffed by Gutierrez. Will the Union draft Steve Neumann? Georgetown attacker Steve Neumann is available in the upcoming amateur draft. The New Hope native spent two summers playing for Union assistant coach Brendan Burke at Reading United. Neumann projects as a top-12 pick, the Union have two of the top six picks, and Neumann has indicated he would love to play for the Union. So will the Union take him? Last year, the Union were in a similar situation. They needed a left back. Another former Reading player, Louisville left back Greg Cochrane, was available. The Union passed twice on Cochrance in the second round. He now plays for Los Angeles. Neumann projects as an attacking midfielder or second striker, and many mock drafts say his tweener positional status may hurt him in the draft. The Union are loaded at forward, if that is what they think Neumann is. If they wanted a young, talented, local forward, they could have grabbed Reading native Corey Hertzog in the 2013 Re-Entry Draft. They didn’t. If they think Neumann is an attacking midfielder, the Union could grab him. They obviously need help there. Still, you don’t draft for positional need in the MLS amateur draft. You draft for talent, period. So, do the Union view Neumann as cheesesteak or roast pork? Broccoli rabe matters, folks. And the provolone must be sharp. Some fans hammered Union chief executive Nick Sakiewicz after his recent statement about the Union wanting to sign three or four players this off-season. Some even called it insulting. Why? Because it was part of a puff piece on the Union web site? Because he shared what the team wants to do, rather than treating this information as a state secret like Peter Nowak did? What would the critics prefer? Nowak’s KGB-style regime? Complete silence? Lies and cliches? OK, so yeah, that last one is what many of you think you got, but the desire to sign three or four players sounds perfectly plausible. Just because your shop only offers Cheez Whiz instead of provolone on your steak, it doesn’t mean they can’t surprise you with some good roast pork one day. The Pablo Perez signing fell through when he signed with Malaga. That’s not a bad thing. It shows your team is competing with the big boys. They’re better off not signing a guy who doesn’t think much of MLS. Those guys usually fail here. They’ll find someone else. Fans have been warming up Sakiewicz’s seat, maybe deservedly so. If the only roster changes before opening day are a few draftees and trialist benchwarmers, then yes, call for heads to roll. But the off-season isn’t over yet. Should Jack Mack shut up? Some fans say McInerney needs to shut up already. He has not exactly hidden his displeasure with the inadequate service from the Union’s midfield. Now he’s talking about leaving Philadelphia. What? Unfiltered truth from an athlete? Accurate assessment of the team? Honest about his contract prospects? That’s it. Off with his head! Philly fans should welcome the honesty. That’s straight roast pork. I’ll take that over fake cheese any day. On the other hand, it’s not like the Union haven’t paid McInerney what he was worth. If McInerney wants more money, he needs to produce on the field. 2013 was an uneven year that showed lots of promise. A fat raise requires more than just promise. It also requires a good, crusty roll for a consistent foundation. Reading that article made me very hungry. Damn it! Now I’m hungry for a roast pork, and no place to get one. By the way, for us New Jerseyians, what’s the deli in Cherry Hill with the good roast pork? I tried to find the name of it, but I couldn’t. I think it’s on Chapel Road, right off Route 38. (Basically, drive down Cuthbert Blvd., past the Courier-Post’s HQ on your left, down to the end of the road. Hang a right. Deli will be on your left a little ways down. If you hit Rt. 38, you went too far.) Little corner deli. The guy’s mom would cook the roast pork. She was fresh off the boat Italian. Amazingly good stuff. Not as good as Tommy DiNic’s, but better than Tony Luke’s. Don’t think they had it every day. Was a special, I think. But this was like … 2003, so it’s been a while since I’ve been there. She was pretty old back then, probably in her 70s. Thanks for the info. Will go hunting for the place sometime. But what if you are an observant Jew or Muslim? I’ve never been so insulted in my life….. of all the thing to compare me too, I get, I get, …… the Philadelphia Union. If I had only been processed into Bacon, maybe then I would get some respect and be compared to an ambitious MLS team (sigh). You are insulted??? I get no mention whatsoever! Yo, Danny boy, how bout you wash down that pile of pig meat with a Red Bull! Heh heh. Old Italian hoagie — 2nd best sandwich in Philly. Yep, I rank it above the cheesesteak. Great piece, Dan, with fine analysis. This is what I come to PSP for. 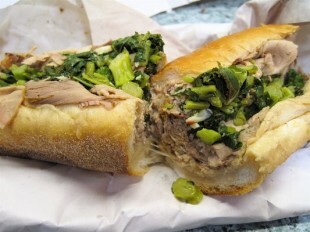 Must eat roast pork sandwich for lunch. I am so freaking hungry right now, and stuck in Long Branch, NJ. FREAKING STARVING. Thanks Dan. And now I just noticed the picture on my phone. Damn you!!!! (Kidding of course). Good stuff. “Stuck” in Long Branch? Do you know how much rent is over there? As a former Tinton Falls resident, I can tell you even 5-10 minutes further inland it’s nothing to sneeze at! I hereby promise to utilize the phrase “That’s so cheesesteak!” whenever I read Nick Sackewicz’s interviews. Right now this whole offseason is cheesesteak. I’m just supremely disappointed so far. I’ll give it some more time, but so far… not so good. That’s an insult to cheesesteak. At best, this offseason has been a veggie burger. scrapple egg and cheese is a DP while the roast pork is generation adidas. You really tortured that roast pork metaphor. I haven’t seen a piece of meat so abused since I was 14 and had Cenemax. You are now the undisputed, inter-continental, heavy weight, internet champion of the universe! Yeah, but I had so much fun with every one of those roast pork lines. 😉 My original draft had none of them. I just added them in late. Loving all the comments on this post, by the way. Laughing as I read most of them (including Sieve’s). Good stuff, guys. Also, people are mad about Jack’s comments? I thought they were hilarious. That’s the kind of guy I want as my striker: ambitious and straightforward. Maybe he’d be better off without all the dismissive gestures on the field, but Henry does all that and more and it didn’t seem to hurt the Metro boys too much last season. So if Michael Bradley and Defoe both go to TFC as is currently lighting the twitterverse aflame, what kind of sandwich are they? The Baconator? Michael Bradley is leaving Roma and might go to TFC? What does TFC have up their sleeves to obtain such high quality? I wish the Union would put their interest in Bradley, he would be a perfect ACM for the U!!! Michael Bradley to Toronto!!! Suddenly we look like chopped meat! Or rather a cheesesteak from a restaurant in a ski lodge in Tahoe!!!!! When can we expect a Hardee’s/Carl’s Jr. commercial featuring El Pescadito and some sorry excuse for a Pork Sandwich Burger? Pingback: Are the Union’s offseason pieces falling into place?